Baking is a science. When you cook something like a casserole or soup you can change things around and still get good results. If you vary the ingredients or cooking time it may not be as good but it will still work. Baking on the other hand is like science. There is a reason there is a certain amount of baking soda to flour to liquid ratio. There is a reason you need to mix a cake for the two minutes the recipe says and there is a reason it needs to bake for forty-five minutes. I am usually very good about following recipes. I do exactly what it says the first time I make it, then if I want to vary it the next time I do. The other day though I got in a hurry. I wanted to make some molasses cookies because they are one of my husbands favorites. I was trying a new recipe. The recipe said to refrigerate the dough for several hours or overnight. Well, I decided that that must be too long and just an hour would be enough. Bad idea! I can’t believe I didn’t believe the recipe. I know the importance of chilling a cookie dough if it says to. It really does make the texture better and helps them from spreading out. Some batters just need chilled. But several hours seemed unnecessary to me. 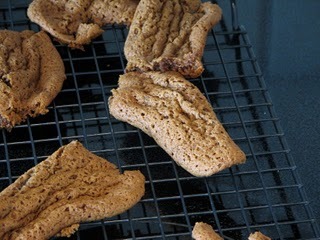 It wasn’t, because this is what my cookies looked like. They spread out all over the place and were very thin. Then when I took them off they did this. 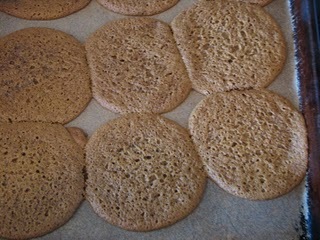 Obviously they were not the prettiest cookies I’ve made. Which was too bad because they tasted wonderful. They were some of the best tasting molasses cookies I have made. So my tip for today is follow the recipe when baking cookies, cakes, breads, etc. There is a reason it tells you to do things like chill the batter! How funny! Yeah, that is the main reason why things don’t turn out for me….I “think” I know better. It took me a while to learn this too! Sometimes I still think I know better than the recipe and it fails =( . What a good tip to keep in mind! Awww, well–at least they tasted good! Are you going to post the recipe? They look like they would be yummy. Yes, I will try and get the cookie recipe posted in the next day or two. They really did taste good!